Christian Site Flips Out Over Funny Or Die Clip [VIDEO] - Joe.My.God. Not only does the video mock Jesus and Christians in its attempt to attack Republicans, but it’s woefully short on facts, providing a nearly literal depiction of the “throwing Grandma off the cliff” attacks liberals have used against political conservatives with regard to health care for decades. 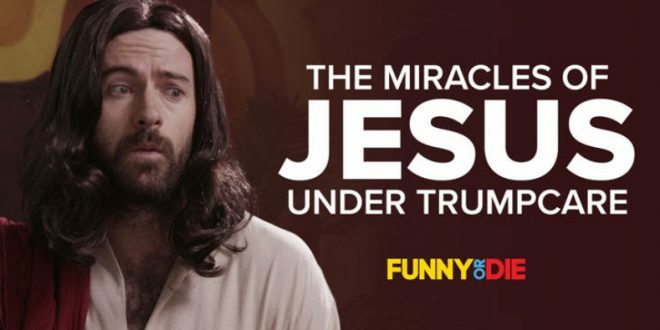 This is the same pathetic approach Funny or Die has taken to mocking Republicans in the past, but adding the blasphemous depictions of Jesus was a new low. As of this writing, the video has been viewed nearly 620,000 times but has earned only 160 “funny” votes. It’s received 50 “die” votes. Commenting has been deactivated for the video, suggesting the group knew it would spark considerable outrage. But, by posting it anyway, they’ve demonstrated their hatred for evangelical Christians and political conservatives.